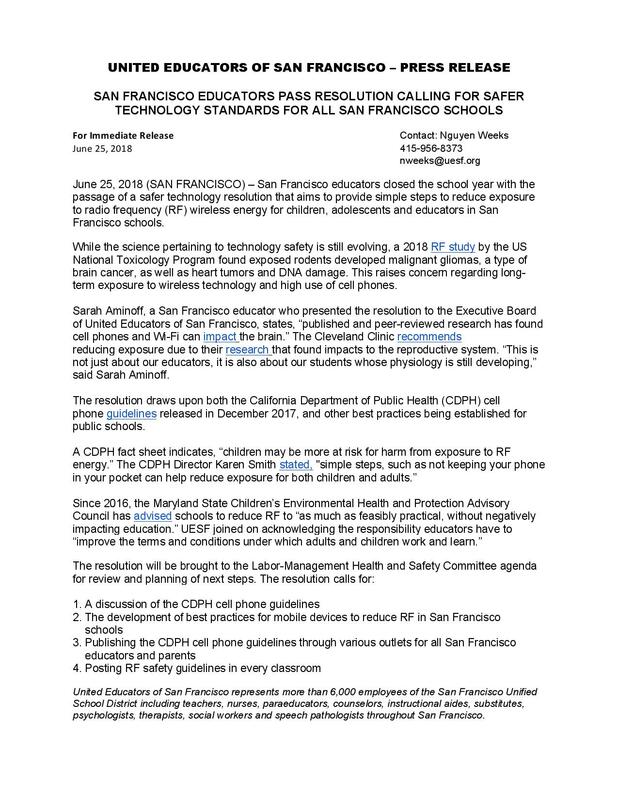 “The California Brain Tumor Association thanks Sarah Aminoff and the United Educators of San Francisco for their collaborative work in regard to dissemination of information regarding best practices for reducing wireless exposure for students, teachers and staff. The California Department of Health, based on scientific evidence, published a guideline sheet in regard to this issue in 2017. It contains excellent information as to simple precautions one can take to use wireless technology as safely as possible. It is critical that teachers, parents and students learn of these precautions. Wireless radiation is not only causing brain tumors but other cancers (wherever the phone is kept on the body), damage to fetuses, damage and death of sperm, and electro-sensitivity. The recent $25 million United States National Toxicology Program study states there is now clear evidence that wireless radiation is causing cancer. Children, teens and young adults are at greater risk as they will have a lifetime of exposure and their bodies absorb more of the radiation emitted“. – Ellie Marks, California Brain Tumor Association. The California Brain Tumor Association focuses on the prevention of primary brain tumors and applauds the efforts of UESF. The resolution became official as of May 23rd, 2018 and the Resolution and press release can be found on the UESF website.